At a media event held earlier today at the Flint Center in Cupertino, California, Apple officially unveiled the Apple Watch, the company’s highly anticipated wearable device. Starting at $349 and launching in early 2015, Apple Watch was introduced as Apple’s “most personal device ever created”, aiming to blend style and function, complex tech and self-expression by offering a mix of traditional timekeeping with a variety of health and fitness-related features, apps, integration with iPhone, and a brand new input method called Digital Crown. Apple Watch is, first and foremost, a watch designed to be worn. Built on the rich history of watchmaking and combining tradition with digital interfaces, Apple Watch has a Retina display covered in glass, inductive charging, and support for 18 interchangeable bands and straps. Apple Watch will come in two sizes: 38mm and 42mm (height), both of which will offer the same features; the models announced by Apple today were made of custom alloys of stainless steel, aluminum, and gold. 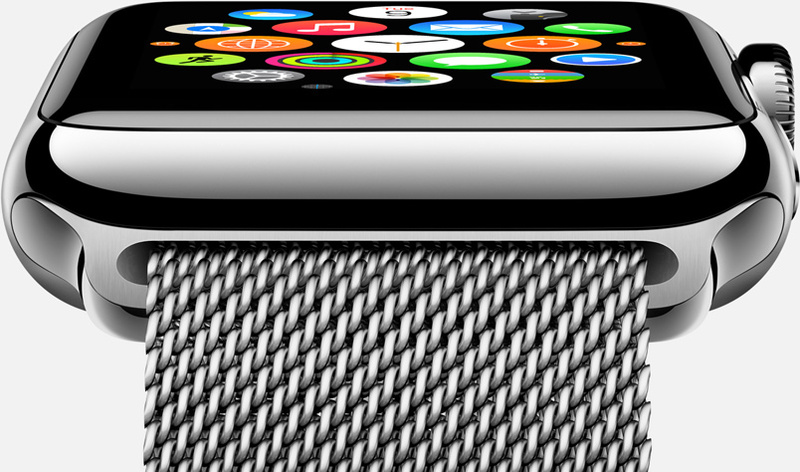 Apple Watch will require an iPhone to work (5, 5c, 5s, 6, or 6 Plus). The basic timekeeping functionalities of Apple Watch will be synchronized with the universal time standard using a technology as precise as the one found in GPS satellites. One of the obvious features made possible by integrating Apple Watch wirelessly with an iPhone, time will be checked against the global standard and automatically adjusted without any interaction required. Apple promised a margin of error within 50 milliseconds, and confirmed that Apple Watch will also adjust its time when travelling or for daylight savings changes. As with the wearable iPod nano from 2010, Apple is bringing a variety of custom-designed watch faces to the Apple Watch, which will offer 11 different designs ranging from a simple analogue clock to space and Mickey Mouse themes. Building on the idea of personalization and “one size doesn’t fit all”, users will be able to customize each watch face with additional functions (called “complications” in the traditional watch industry) such as news feeds, stopwatches, or weather information. Apple touted “millions” of possible combinations for the device’s watch faces – which will be instantly displayed when users raise their wrist thanks to a sensor built into the watch. Besides size and digital watch faces with custom features, the Apple Watch will be highly customizable with different collections, straps, and bands designed by Apple. Next to diamond, sapphire is the hardest transparent material on earth. That makes it ideal for protecting the Retina display. To harvest the crystal, we use a very thin diamond-cutting wire. The sapphire is then precision-machined into its final form and polished for many hours to produce the desired finish before an antireflective coating is added. Today, Apple announced the Apple Watch as a modern take on the classic watch that results in a precise, finely crafted timepiece, an iPhone companion, and a comprehensive health and fitness device. Tim Cook noted how Apple wanted to make a product to enrich people’s lives every single day, and Jony Ive remarked how very complex tech has been made accessible to everyone by blurring the boundaries between watch and smartwatch. That’s not to say, however, that the Apple Watch doesn’t carry some amazing new hardware technologies and software features that aren’t worth covering in detail. The Digital Crown is Apple’s first innovation: reminiscent of the crown in traditional watches and designed after the component used by the watch industry for centuries, Apple’s version is used to zoom, scroll, and select options in the device’s user interface. The company noted that smartwatches that require you to use gestures extensively on small displays are impractical; therefore, faced with the challenge of controlling a user interface without obstructing the display, Apple augmented the historic crown and turned it into a brand new input method. Every new product we’ve introduced has been defined by a unique input device. With Apple Watch, it’s the Digital Crown. On mechanical watches, the crown has historically been used to set the time and date and to wind the mainspring. We reimagined it as a versatile tool that answers the fundamental challenge of how to magnify content on a small display. Pinching to zoom, as you do on iPhone, is impractical. But rotating the Digital Crown allows you to zoom and scroll nimbly and precisely, without obstructing your view. The Digital Crown also serves as a Home button: press it once, and you’ll return to the Home screen. 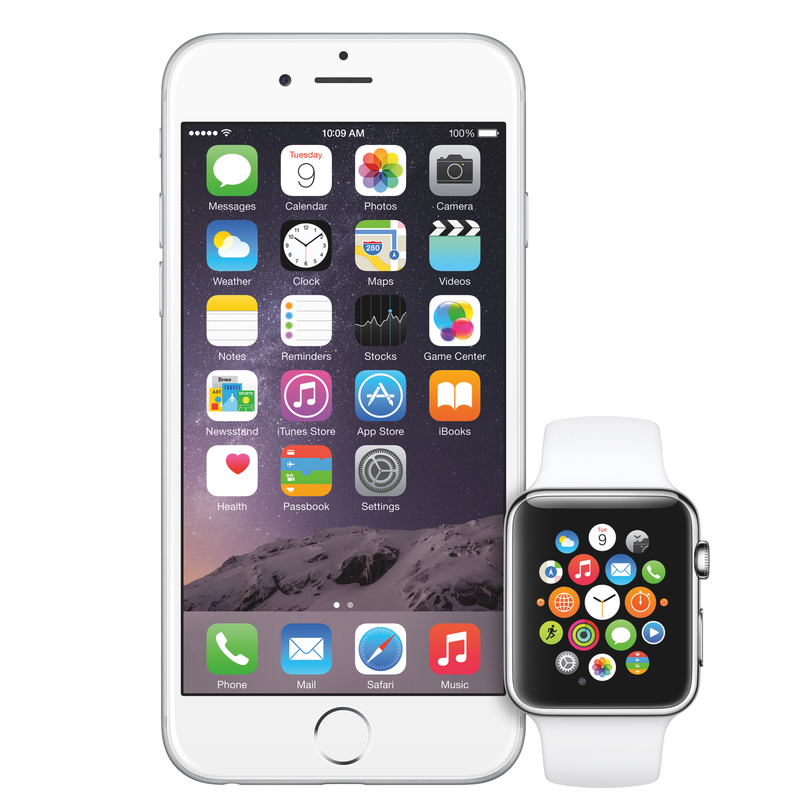 Like on iOS, the Digital Crown will also be used to access Siri, which has been ported to the Apple Watch. The Digital Crown won’t be the only physical button in the Apple Watch: underneath it, you’ll find a button to access Friends, a grid of your favorite contacts that’s similar to the Recents shortcuts in the iOS 8 multitasking view. The Friends view will let you tap on a profile pictures to send a message, initiate a call through the iPhone, or communicate with other Apple Watch apps. Apple Watch communicates with your iPhone, but its apps are also fully interactive on the device itself – albeit with different types of input and new features. In the demos, Apple explained that a tap on the screen will open an app or zoom into an “app neighborhood” to enlarge icons and choose a specific app; the Digital Crown will be used to scroll, zoom, and rotate options you want to select. Two Home screen designs from two different eras. Many of the apps shown today were Watch versions of existing apps such as Messages and Photos, slimmed down to essential interactions such as replying with “smart” replies, dictations, or new animated emoji; other apps like the Camera were used as utilities for the respective main app running on the iPhone (in Camera’s case, a shutter button and viewfinder). Apple announced that hundreds of developer partners are already building third-party apps for the Apple Watch using a WatchKit framework. The design language that Apple launched last year with iOS 7 feels right at home on the Apple Watch, but it has obviously been tweaked to feel “amazingly fresh” and yet “visually reminiscent of what you’re used to seeing”. Because it’s connected to your iPhone, Apple Watch can present time in a more personal way. One that’s based around your life and schedule. You’ll receive real-time notifications for incoming mail, messages, and calls. So you can answer or dismiss them instantly. And since Apple Watch sits on your wrist, your alerts aren’t just immediate. They’re intimate. With a gentle tap, notifications subtly let you know when and where your next meeting starts, what current traffic conditions are like, even when to leave so you’ll arrive on time. At any point, you can simply swipe down to Notification Center to view what you may have missed. In addition to a flexible Retina display and multi-touch, the Apple Watch will be capable of distinguishing a simple tap from a deep press using a technology called Force Touch. In today’s on-stage demo, Force Touch was demonstrated as a sort of modern take on tap & hold and contextual clicks, reinvented for pressure and force. This new gesture will act as a contextual menu activation system to open different menus and trigger access to on-screen controls. It uses “tiny electrodes around the flexible Retina display” to add another dimension to the UI that apps will be able to intregrate with. At the heart of the Apple Watch is the S1 chip, a compact module that integrates several subsystems in a single package and that Apple calls a “singular feat of engineering and miniaturization”. More interesting from a user experience perspective, however, is the haptic feedback system built into the watch based on the “Taptic Engine” designed by Apple. Using a linear actuator inside the Apple Watch, you’ll feel a tap on your wrist for different types of feedback, notifications, and more. In less technical terms, it taps you on the wrist. Whenever you receive an alert or notification, or perform a function like turning the Digital Crown or pressing down on the display, you feel a tactile sensation that’s recognizably different for each kind of interaction. Combined with subtle audio cues from the specially engineered speaker driver, the Taptic Engine creates a discreet, sophisticated, and nuanced experience by engaging more of your senses. It also enables some entirely new, intimate ways for you to communicate with other Apple Watch wearers. You can get someone’s attention with a gentle tap. Or even send something as personal as your heartbeat. There are two aspects to Apple’s mention of heartbeat monitoring. The first is Digital Touch, a set of communication tools for Apple Watch users that will allow them to communicate with quick sketches, taps, haptic feedback, and heartbeat sharing. The latter is surprising, and Apple described it as a way to tell someone how you feel by letting them see and hear your heartbeat. It even comes with an animated heart displayed on screen. The second is a heart sensor built into the Apple Watch, which is at the core of the device’s focus on being a fitness tracker and a sports watch. Apple Watch has been designed for people who just want to be a bit active, who work out a few times a week, or athletes who exercise constantly for their daily routine. Thanks to sensors built into the watch that have a direct contact with your wrist and skin, the Apple Watch will be able to monitor a wide array of data, analyze it, archive it, and, over time, learn from your habits and provide meaningful suggestions. The device will use an accelerometer to measure your total body movement, WiFi and GPS from your iPhone to track distance, and a custom sensor (located in the back of the watch) to track your heart rate and intensity of daily activities and workouts. Apple stressed that their aim was to not only measure the quantity of movements on a daily basis (which is already done quite well by the iPhone’s M7 motion coprocessor), but also the quality and frequency of movements – which is only possible through sensors installed on a wrist-worn device. On the Apple Watch, you’ll find dedicated Activity and Workout apps that will, as the names imply, track your movements and workouts. Activites will be divided in moves, stands, and exercise that will be displayed through rings that will fill up as you keep moving and being active. Apple’s goal is for users to “sit less, move more, and get some exercise by completing each ring every day”; progress will sync back to a Fitness app on the iPhone that will presumably launch early next year. 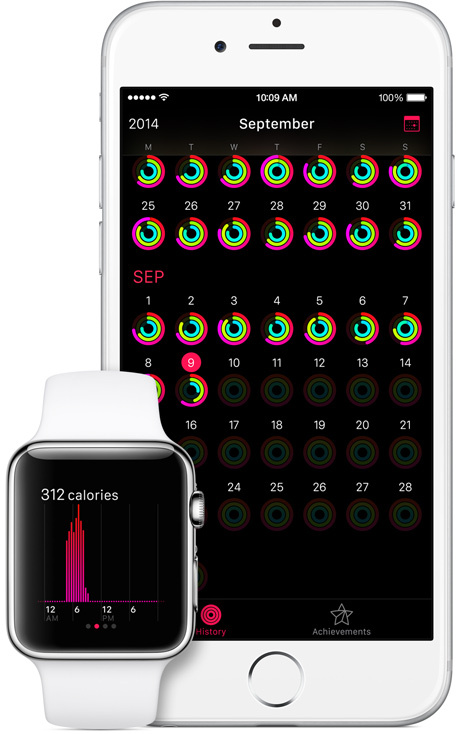 Data from the Activity app on the Apple Watch will also sync back to the Health app on the iPhone, launching next week with iOS 8. The Workout app, on the other hand, will be used to track different types of workouts and provide encouragement to the user to, say, keep going during a run or finish a cardio workout. The app will display intensity through the heart rate sensor, unlock achievements such as badges as a form of reward, and it’ll store all of its data in the Activity app (there doesn’t seem to be a Workout equivalent for the iPhone yet). Today, Apple only confirmed that the Apple Watch will launch in “early 2015” starting at $349. The Apple Watch will feature deep iPhone integration with Handoff, Continuity, and the aforementioned Activity and Workout apps, which will work in tandem with the Health app launching next week with iOS 8. A collection of interesting links, photos, and videos about the iPhone 6 and iPhone 6 Plus. Constantly updating. Apple’s press release for the Apple Watch. 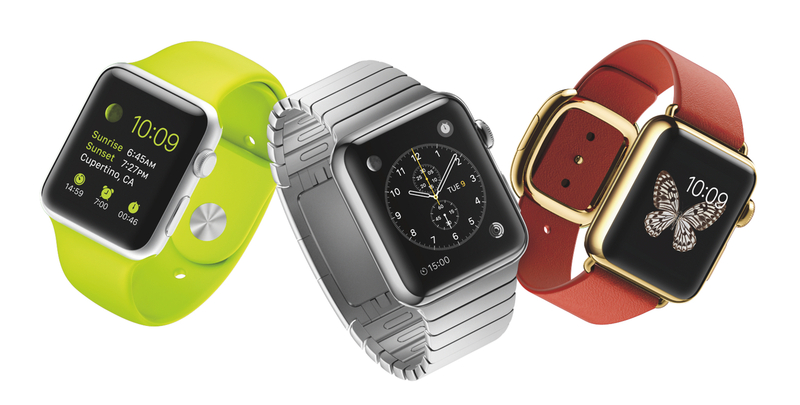 The complete gallery for all the Apple Watch models announced today. All the videos produced by Apple for the Apple Watch. You will be able to activate Siri on the Apple Watch by raising your wrist and saying “Hey Siri”. Apple has posted a gallery of pre-installed Apple Watch apps (with screenshots and brief recaps of their features) here. According to an Apple representative and as reported by The Mac Observer, there will be a setting to enable a left-handed mode for the Apple Watch. Suggestions in the Messages app will be “based on the things you write most”. The Apple Watch has a built-in speaker and microphone for phone calls, which you can also silence by covering the watch with your hand. The Verge has some beautiful hands-on photos of the Apple Watch, describing the smaller model as “very solid and surprisingly light”. 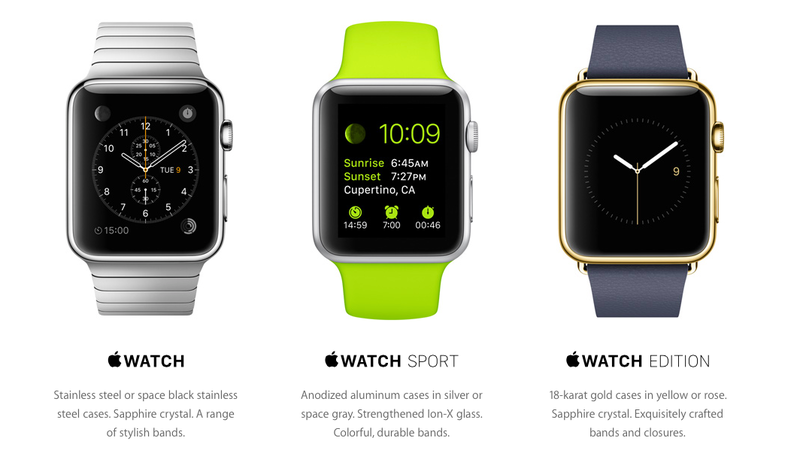 An overview of the Apple Watch Sport. 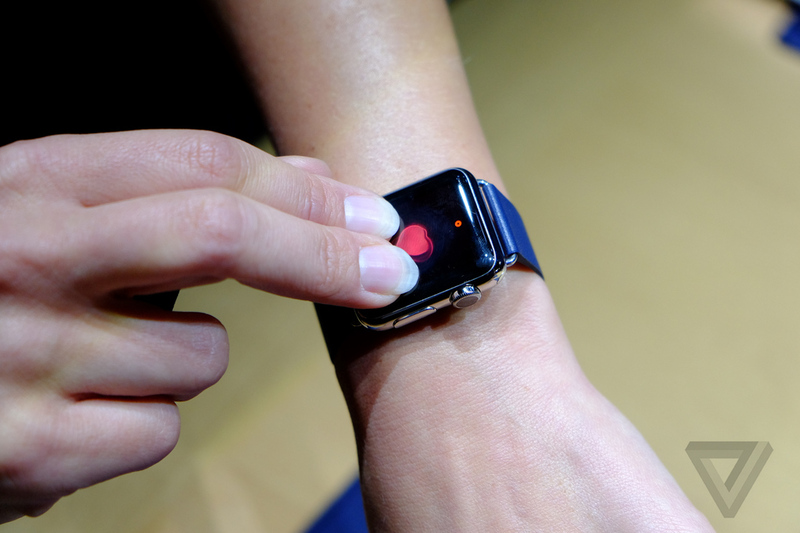 The Verge goes hands-on with the Apple Watch. 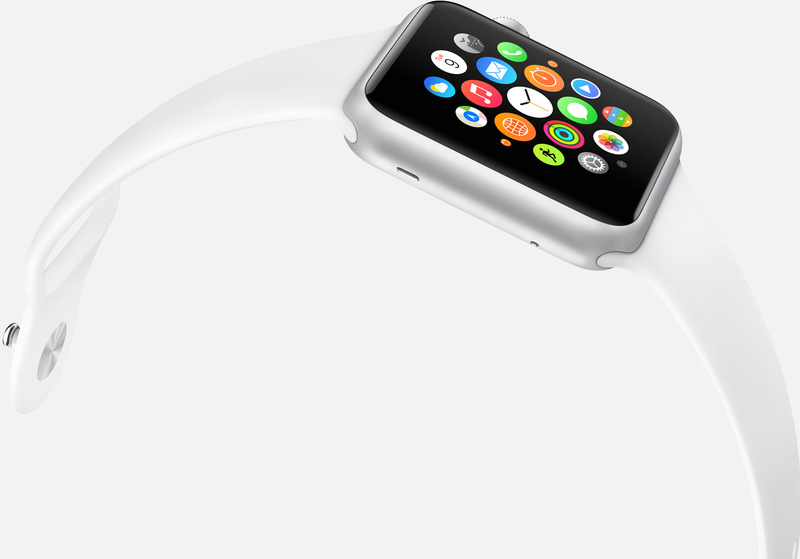 A five-minute demo of the Apple Watch Sport. Another demo video by CNET. In SlashGear’s hands-on, we can see the various supported gestures in action. As you’d expect, the build quality of each model was impeccable, with a smooth-scrolling crown control and a satisfyingly solid “snick” happening when pressing it or the button situated alongside. 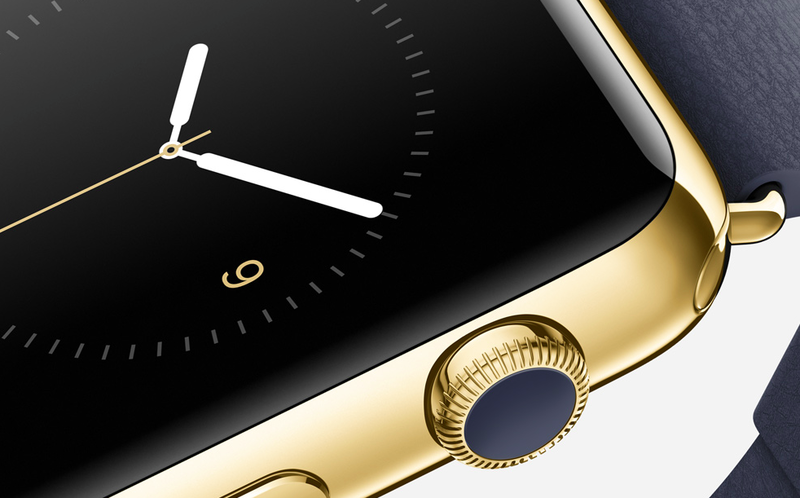 Whether gold, steel or aluminum, it’s clear that every Watch has been designed and crafted with care – and manufactured to Apple’s usual lofty standards. That said, it’s still a fairly bulky thing to have on your wrist (in both sizes), and no matter how many bands Apple makes for it, we’re not sure that the Watch’s looks will appeal to everyone. The display on the larger model I tried on was bright and crisp, and the circular app icons were definitely large enough to discern. I’m still not convinced I’m going to want to actually look at a Map on a screen this small, but using it to navigate—little buzzes telling me where to turn and when—would be welcome. For more coverage, check out our September 9 news hub and follow @macstoriesnet on Twitter.